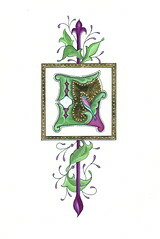 Finishing up my decorative letter from the IAMPETH conference. Used leaf gold - which I am now able to do thanks to Instacoll! Love it! gasp. That is fabulous. How I love your letters...and now illumined ones! What is "Instacoll"?